The Cumberland & Dumfriesshire Farmers Mart P.L.C. had forward 3,078 store hoggs & 202 in lamb sheep and ewes with lambs at their weekly sale at Longtown on Tuesday 16th March 2010. Store hoggs were still in strong demand, selling to a top of £85 for Suffolk crosses from Old Cambus; Texel £84.50 High Stenries, £83.50 Beechcroft, £81.50 Ashley Park; North Country Cheviot £84.50 Adderston Shields, £82.50 Browtop; Hill Cheviot £83.50 Girnwood; Greyface £80.50 Taylorburn, £73.50 Merryshields; Clun £79.50 Rigg Heads; Half Bred £78.50 Adderston Shields; Charollais £76.50 Rigg Heads; Blackface £68.50 Tecket; Herdwick £55.50, £53.50 Rowhead; Swaledale £51.50 Beechcroft. 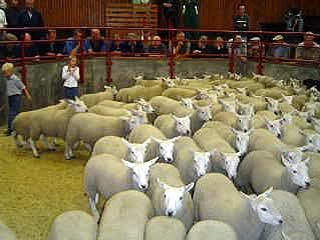 Cast ewes to £87 Gass, hill types £56.50 Carpet Farm. Ewes with lambs at foot were easy to sell with Texel cross ewes with twins to £59 and £54 from Crossgates. In lamb Blackface ewes (scanned singles) to £48 Haithwaite. Greyface geld hoggs to £80 Patties Hill.